It’s fall, the weather is cooling (somewhere) and we’re diving into the season’s familiar flavors. Lucky for us, that includes crisp, sweet tart apples. In a world where most produce is available year round, there’s still something about tasting something in season that is particularly satisfying. Apples, particularly ubiquitous and endlessly available, are best when freshly picked and right out of the orchard. Our weekly produce deliveries now include an assortment of apples and we couldn’t be happier to include them in our rotation. They typically show up on our brunch plates, sautéed in butter and sweetened with maple before joining Jason’s crazy delicious multigrain pancakes. A recent batch of Granny Smith apples ended up in these tasty muffins where they add both sweetness and moisture. 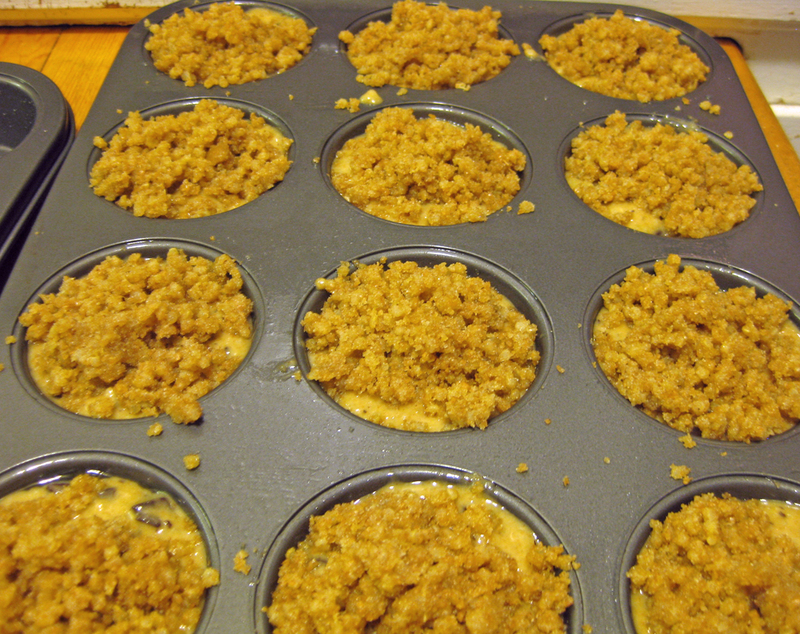 The addition of leftover cooked steel cut oats further helps keep the muffins from drying out. Both apple and cooked oats reduce the need for moisturizing fats. For those of us who pay attention to such things, the reduced fat and added fiber mean these become everyday muffins, perfect for breakfast with a little yogurt or as a snack whenever our hunger begs for a quick fix. Spray muffin tins with non-stick cooking spray or line with muffin papers. In a large bowl, whisk together the grated apple, leftover oatmeal, eggs, melted butter, kefir and brown sugar until smooth and there are no clumps of oatmeal. Add the salt and whisk a few more times. In a separate bowl, whisk together the flours, baking powder, baking soda and cinnamon. Fold the flour mixture into the wet mixture until combined. Be careful not to over mix. 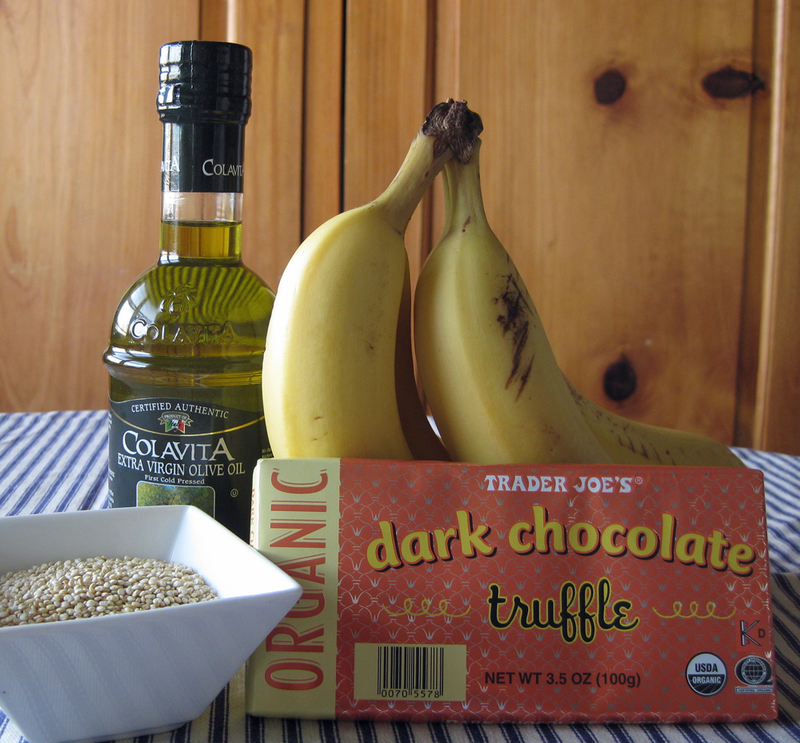 In a small bowl, mix together the rolled oats, brown sugar, and melted butter for the topping, set aside. Spoon batter into prepared muffin cups. These will be big muffins so don’t worry if the muffin tins seem to be over filled. Sprinkle the muffins with rolled oat topping and place on the middle rack of the oven, bake for 22-26 minutes, or until a toothpick inserted into the center comes out clean. If you’re worried about the muffin batter overflowing, place a sheet pan under the muffin tin. Cool the muffins in the pan on a rack for a few minutes then remove from pan.